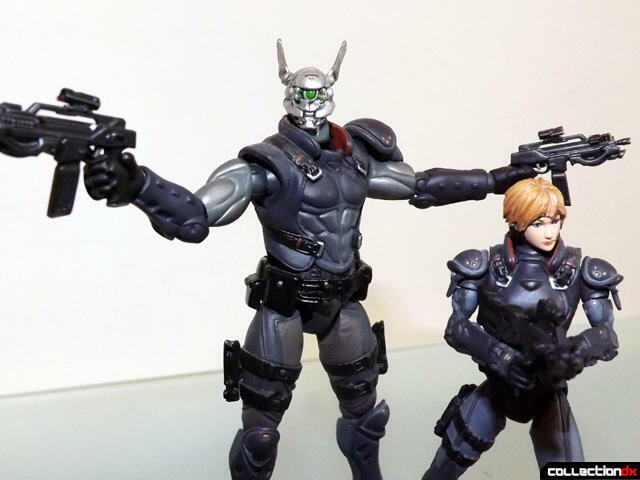 Appleseed is a series created by Masamune Shirow (creator of Ghost in the Shell) that began in 1985, spanning four graphic novels, an OVA, two CGI animated movies and a new series "Appleseed XIII" which is currently awaiting release in the west. The series is heavily influenced by the Cyberpunk genre featuring a female E.S.W.AT. team leader, Deunan Knute as its lead character. Accompanying Deunan through all versions of the series is her partner and sometimes romantic interest Briareos Hectonachires, who due to injuries has had three quarter of his body replaced by cybernetics. 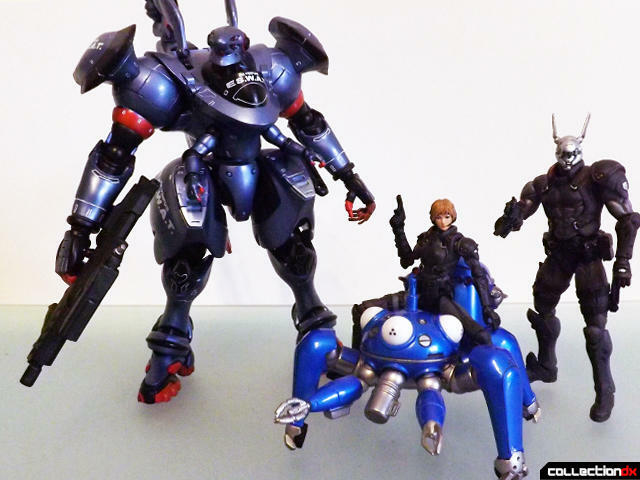 These Hot Toys 1/20th scale Snap Kit figures are based on the two Shinji Aramaki Appleseed films released in 2004 and 2007 respectively. 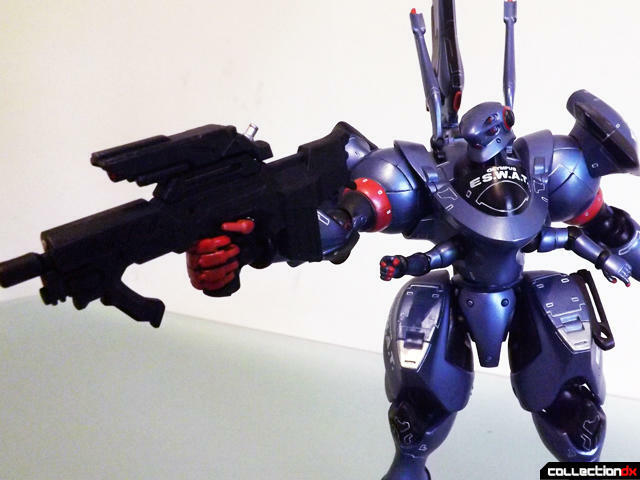 Appleseed first appeared on my radar in the early 90s when the OVA was released on video, and I quickly became a fan. This set includes Deunan, Briareos, Tereus (who is also a Bioroid clone of Briareos before his cyber-conversion), Aeacus, Rhoetus and an E.S.W.A.T. Landmate. Each character comes with one or more weapons, Deunan also comes with her sword and a sheath that fits on the back of her belt, but unfortunately due to moving recently i cant find them for my set. The Landmate feels solid, I wouldn't recommend you let your kids play with it, but it will stand up to regular re-posing, however the other figures feel a lot more fragile. With patience they will pose the way you want but it can take time to get the balance right. First up we have the three secondary characters from left to right - Rhoetus, Tereus and Aeacus. 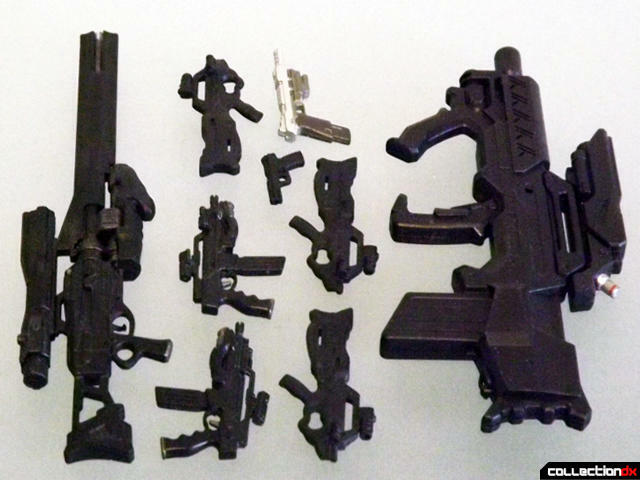 These figures stand around 4 1/2 inches each, their weapons are interchangeable. Aside from Aeacus they can hold weapons in either hand, Aeacus however can only hold a weapon in his right hand as his left is a clenched fist. Their articulation is good for the size for the figure, but it does tend to be difficult getting them into poses due to their ankle joints being slightly weak. The shoulder, neck, hip and feet are on ball joints; the elbow, wrist and knees are pin joints, with the knees and elbows able to get a 90 degree bend. 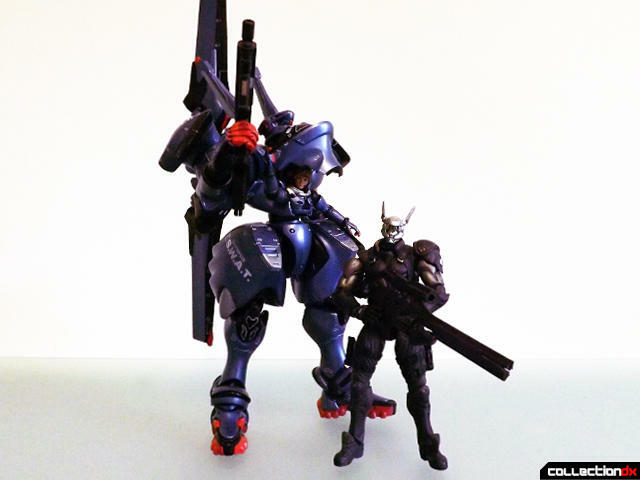 Briareos is the largest of the figures standing around 5 inches to the top of his "rabbit ear" sensors, and Deunan is the smallest figure standing at around 3 3/4 inches. Their articulation is the same as the other figures, but Deunan feels far more fragile. 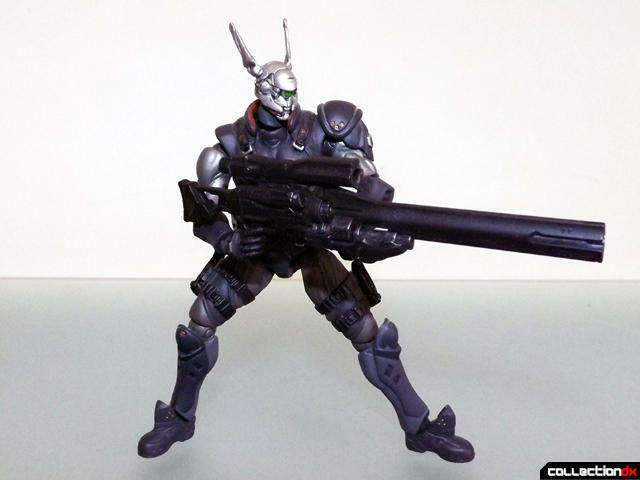 Briareos comes with a set of two weapons, his duel weld machine guns and his huge sniper rifle which measures 4 inches long. He is the only figure to be able to hold this weapon and still stand. Deunan is the best character to fit into the cockpit of the Landmate. 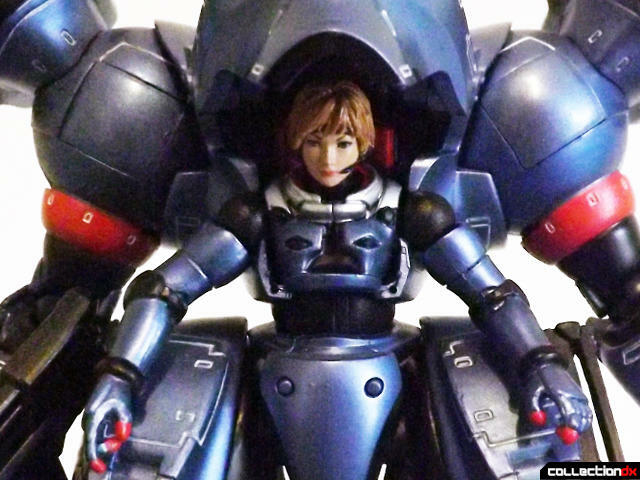 To do this all you have to do is remove her head from the figure and attach it to the ball joint inside the cockpit body. You can fit all the other character heads onto this body except Briareos but the other characters heads are a tighter fit. The cockpit itself opens upwards and you can remove the body section to add which head you prefer. The cockpit joint itself is on a friction joint, so it doesnt click in anywhere, but does hold open or closed reasonably securely. In the series Landmates stand somewhere between 12 and 20 feet tall and are used in areas such as military, police, construction and even pest control! 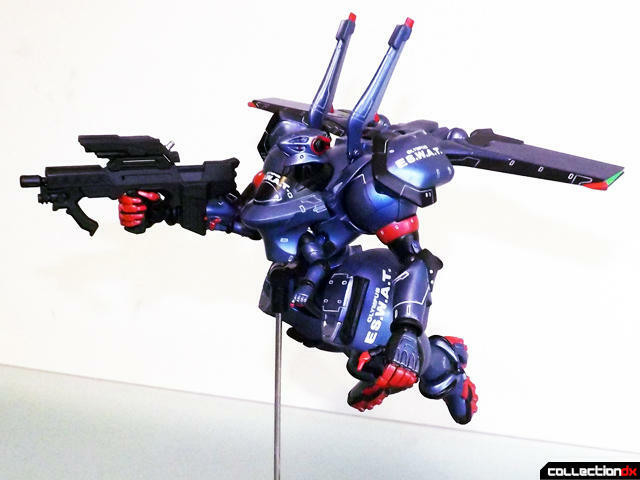 They operate using Motion Control and the user sits in the torso and operates the legs with their own. 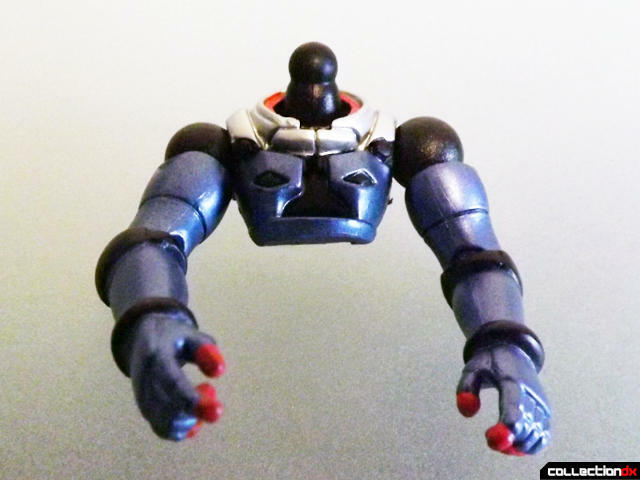 The arms are operated by the users arms which appear as small arms on the torso, so whatever movement the user makes, the Landmates arms will copy. 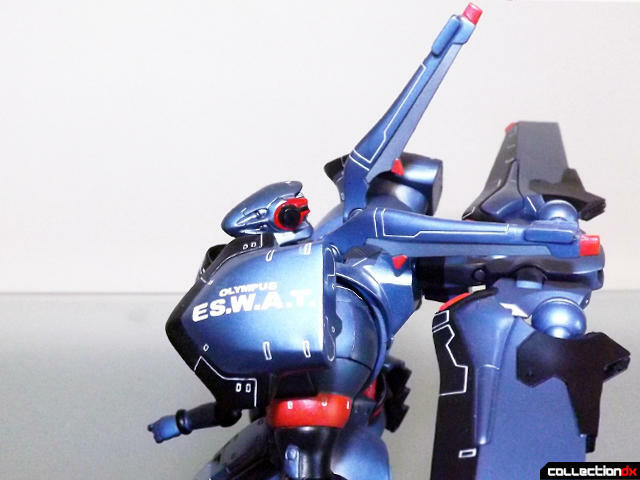 The E.S.W.A.T. Landmates have Damysos Anti-Gravity Blades that attach to the Landmates' back which allow them to fly and hover. On the figure, the Anti-Gravity Blades can be rotated on a swivel joint to face up or out at the side. The Landmate has white detailing all over and has the E.S.W.A.T. logo on each shoulder, thigh, as well as across the top of the chest. These figures sometimes pop up online to buy, and I was lucky in being able to get the whole set for around $270. 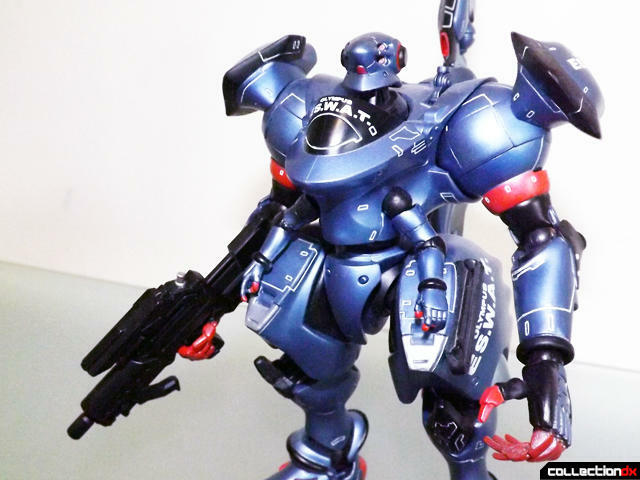 For a fans of Appleseed, if you can find the set, and if you can afford them, I would greatly recommend purchasing, especially the Landmate. Excellent review. My all time favourite anime. Very hard to find Landmate these days. I always wanted these, but missed out while they were still on the market. 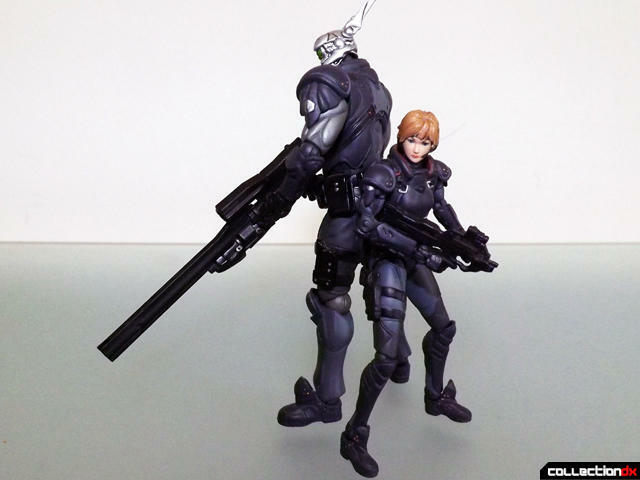 Are they about in scale with the Yujin trading figures for the first Appleseed movie? 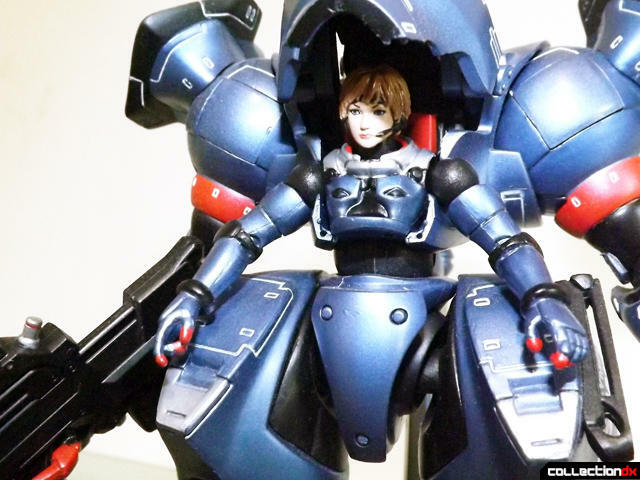 Do you know how big the Yujin trading figures are? for this set the figures are between 3.5 and 5 inches tall. 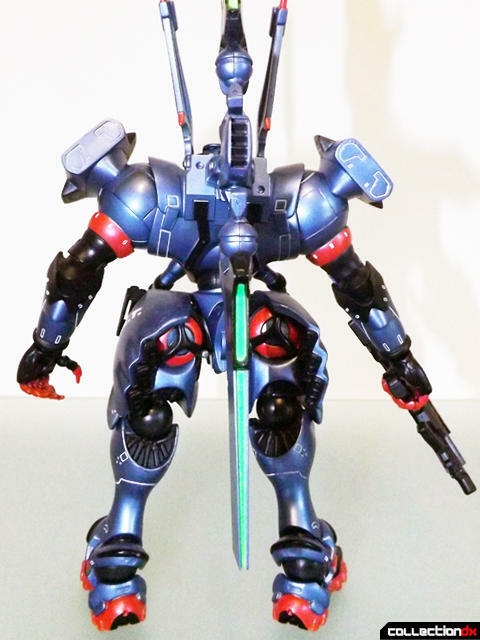 i did forget to add the size of the Landmate in my review, from head to toe its 7 inches, from the shoulder senors to the feet its 9 inches, with the gravity blade its 11 inches. 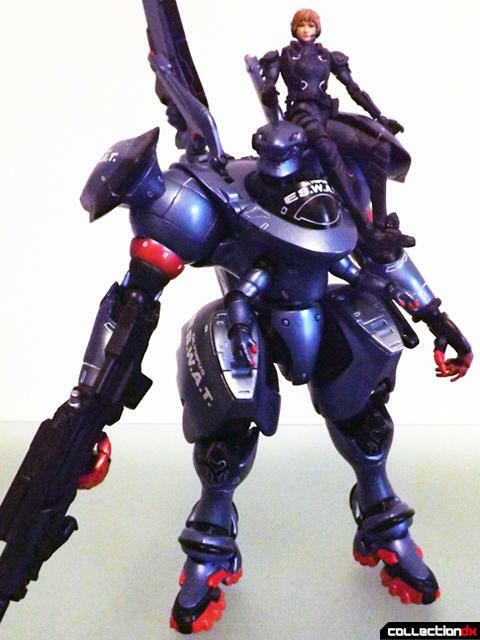 I don't have them handy right now, but the Yujin figures are about the same size, approximately 1/18 scale, with Deunan and the ESWAT boys being less than 4" tall and Briareos being taller. 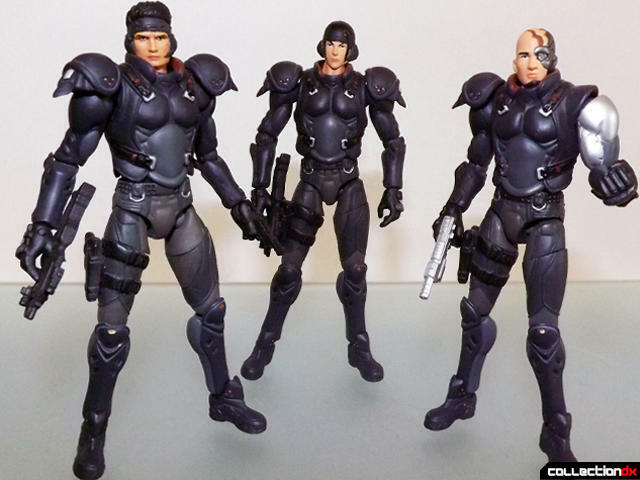 But proportions can be such a big deal with small figures - those Yujin figures look just about right when they stand next to figures based on the Microman Micro Force and Microlady bodies, but I doubt they'd look as proportionate next to, say, a GI Joe. I guess I'd really have to see them side by side with the Hot Toys figures to really know. I've got both the Yujin figures from the first movie as well as the Hot toys snap kits from the second - they scale quite nicely with each other, both being around 1/18 scale. The quality of the Hot Toys figures blows the Yujin ones away, though. Just about every one of mine has had some part on it break somewhere along the way, whether it's Deunan's shoulder or bri's antennas. 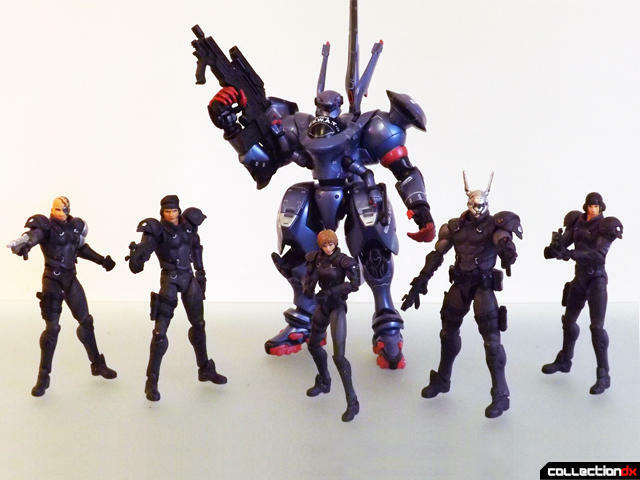 Still, in the rather limited world of Appleseed merchandise they're neat figures in their own right and do display well as a counterpart to the Hot Toys kits. I've got the 1/6 versions. I forgotten about these! I think I have two sets in the closet, both unopened as I never found the time to put them together. How much are these selling for these days? if you can find them together, a lot! i was lucky in finding a seller in china who needed to sell his fast and was willing to sell for less than their value. the single figures sometimes pop up on ebay, but go for around $60 each.